Guardian 6000 Plus | Electrical Safety Analyzer | QuadTech Inc. The Guardian 6000 Plus is able to perform several dielectric tests in one unit including AC/DC Hipot, Insulation Resistance,Ground Bond, Open/Short Check and optional Leakage Current for compliance testing of IEC, UL, TUV, CSA, EN and other standards including IEC60601-1, UL2601-1, IEC950, UL544, UL60950. The time-saving TwinPort™ feature performs Hipot and Ground Bond simultaneously cutting time for these tests in half. The open / short check function (OSC) checks for an open connection or a DUT short during testing. Open connections may cause a bad DUT to test OK. Screening for shorts prevents damage to the equipment saving potential costs that may occur. These patented features are only available in safety products manufactured by Chroma. 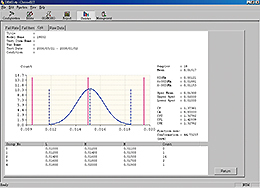 EST software controls the analyzer to perform electrical safety integrated tests from the PC. The EST software allows you to save test procedures and data directly as well as exporting the data EXCEL files for quick management reporting and statistical analysis.